Five easy ways to create a new habit - make effective changes today! In the last few months, I’ve been through considerable change. After 14 years as an employee and nearly eight juggling life as a working mum, I left my job as a Business Analyst to be with my boys and focus on my writing. This also coincided with an unfortunate fall that forced me to experience life as a busy mum-of-three, on crutches. And I can tell you that that’s not easily done, not without a lot of help! But all this change actually motivated to make even more changes to my life. And make a conscious effort to introduce new, healthier habits. Now, that’s not easily done, as change is notoriously hard. But these are some very easy steps that I found work for me. And if they work for the very change-averse type I am, then they’re bound to work for a lot of other people too. It’s tempting to want to change too many things at once. But that’s a recipe for disaster, really. Trying to do too much only sets us up for failure, which is demotivating and makes us give up altogether. So just pick a few things that are important to you. Your priorities, if you like. Think about your goals and desires and about the things that you’ve been wanting to do for yourself for a long time. If they’re big projects, then break them up into smaller tasks that you can do on a daily basis and in little time. Now that you’ve picked a few, important things that you want to focus on, commit to them. Write them down on a habit tracker of some sort. Use an app or, even better, make a quick table with the days of the week and your new habit and stick it on the fridge. It doesn’t have to be anything fancy – just something that serves as a visible, daily reminder. Once your new habits are there in black and white, staring at you in the face, you’ll find it harder to forget or shy away from them. You’ve made that commitment now, and you don’t want to not tick things off. Basically you want to make it harder for yourself not to do them. If you’ve picked a 20-minute cardio workout as one of the things that you want to do, for example, having that item on your habit tracker on your fridge isn’t going to help if you never have 20 minutes in your day to allocate to it. When can you do your cardio workout? Early in the morning before you go to work or the children get up? During your lunch break? Straight after work before you go home? Whatever it is, think about when you can schedule it in, so you know that that is the time every day that you dedicate to this new activity or task. Once it becomes part of your new routine, you’ve got it. It’s a habit, and you no longer need to work on it. Over the weekend, I did just that. I told a friend about one of my goals for this year with the expectation that from time to time she’ll ask me how I’m doing towards it, and if I’ve not made any progress, I’ll feel embarrassed. Mind you, it won’t be her problem. She won’t think any less of me. But reaching that goal is important to me, and every time I get asked, I’ll be reminded that if things aren’t moving fast enough in the right direction, I need to work harder or simply differently on it. So make you sure you find a way to help you nearest and dearest holding you accountable to yourself. Because you are. You’re the only person you’re actually accountable to when it comes to creating a new habit that you want to create. And who knows? You might even get a bit of extra support in the process – your work colleague might also want to join you in that 20-minute cardio workout at lunch time. It’s a subtle mindset switch, but it’s oh, so important. When you get up in the morning, don’t just think: “Ah, today is Monday. If I feel like it or have time to, I’ll go for a run on my lunch break”. Easier said than done? Yes, in some cases. Sometimes life happens and things you can’t control get in the way of your plans, but as long as you don’t let yourself postpone or skip the activity or task that you want to make into a habit, you will succeed. And you’ll feel a million times better for it. You can also read this post on the HuffPost Lifestyle UK. Tracey Bowden recently posted…Do You Wake Up Ready? Plus Win A Sleep Hamper including a Lumie Light. Good luck with it all Beth – keep them simple, and I’m sure you’ll manage to just fine! This makes a lot of sense and is really inspiring. In some ways I already do a lot of these things but with a huge side order of guilt. I’m one year just gone into being a stay at home Mum and still feel lazy and unproductive so this will really help me find better purpose and given myself credit. Thank you. Guilt comes with motherhood, doesn’t it? But I’ve really been thinking a lot about this lately (and not found an answer) – where does all this guilt come from??? No one needs it. It’s holding us all back! Please do give yourself lots of credit for being a stay at home mum. It’s hard! So give yourself A LOT of it and never forget how much you do all day, every single day! Good luck with it all! 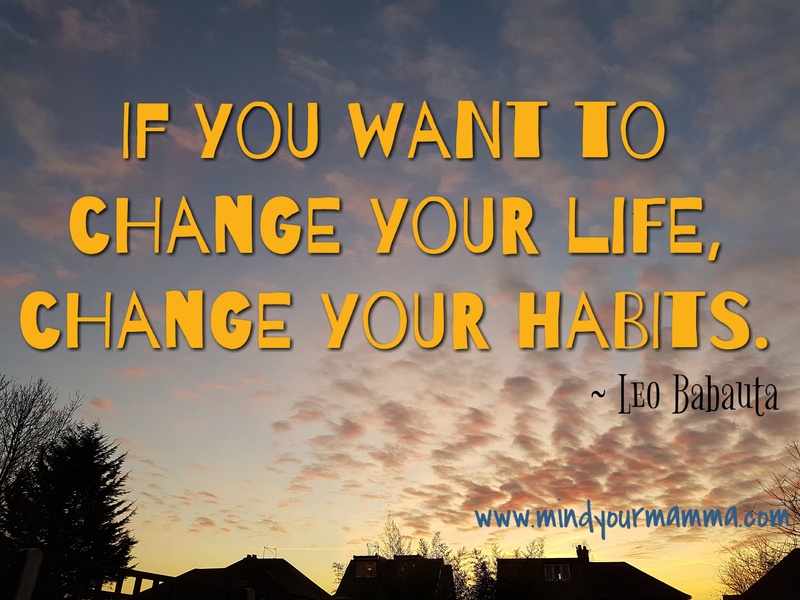 Thank you Becky – you can download a habit tracker by subscribing to my blog. You can add your own habits to it and make yourself accountable. I think you’re right – you just don’t want to tell your friends you failed! They won’t judge you, but you won’t like it, right? Accountability is probably why I started blogging in the first place! If I have to write about it, I have to do it! I’m also trying to drink at least 6 glasses of water a day, but I’m not doing great with that (yet)! I know – I find prioritising and scheduling quite hard too!